A man and a woman who hung from the rafters during a Vikings game and unfurled a banner in protest of the Dakota Access oil pipeline entered U.S. Bank Stadium with tickets, and stadium officials said Tuesday that protesters hid their climbing equipment under winter clothing. 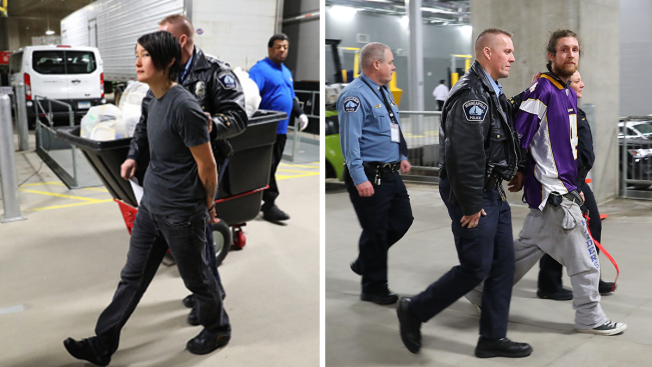 Three people were arrested Sunday after two protesters rappelled from the roof of the Minnesota Vikings' stadium during their season finale against the Chicago Bears. The game was not interrupted, but eight rows of fans seated below the protesters were evacuated. The two climbers — who identified themselves as Sen Holiday, 26, of St. Paul, and Karl Zimmermann Mayo, 32, of Minneapolis — met with reporters Tuesday but refused to answer questions about how they entered the building. Authorities haven't said how the third person was involved. None of the people have been formally charged and police are still investigating. Security at the stadium is designed to detect items such as weapons and explosives. A statement from the Minnesota Sports Facilities Authority and stadium manager SMG says individuals concealed nylon rope, carabiners and a lightweight banner, and the items were distributed among protesters after they got inside. The statement did not make clear who carried in the equipment or say whether more people may be involved. "They had nothing visible in their possession that violated U.S. Bank Stadium policies and had nothing that prevented them from clearing the security screening upon entry," the statement said. Security photos included with the statement show Holiday and Zimmermann Mayo entering the stadium. In one image from inside the stadium, Holiday appears to be carrying a backpack that was not visible in images showing her entering. Once inside, the protesters went onto the ridge truss by scaling barriers that blocked off the area, the statement says. Officials said they've taken steps to make design changes to prevent something similar from happening in the future. "We expect to make additional changes, as we continue to evaluate protocols to strengthen security here, and share our findings with other stadiums across the country," the officials said. The banner the protesters unfurled urged Minneapolis-based U.S. Bank to divest from the four-state, $3.8 billion pipeline. Opponents contend the pipeline could affect drinking water and Native American artifacts. Texas-based developer Energy Transfer Partners says the pipeline will be safe. After hanging the banner, the pair hung in a seated position about 100 feet above the seats that were evacuated. They watched the rest of the game, occasionally shifting positions or waving at spectators. Zimmermann Mayo wore a purple Brett Favre Vikings jersey. Vikings spokesman Jeff Anderson said 185 ticketholders were moved because of the protesters' stunt above. Anderson said all of those fans will receive a full refund. Protesters say U.S. Bank has extended a large credit line to pipeline developer Energy Transfer Partners. "This pipeline is not ethical," Zimmermann Mayo said Tuesday. U.S. Bank spokesman Dana Ripley declined to comment. The pipeline, which is currently on hold, would carry oil from western North Dakota through South Dakota and Iowa to a shipping point in Illinois. Protesters camped in North Dakota for months to try to stop completion of the project. During a similar incident in November 2015, two people rappelled from the upper deck and hung a banner during a Carolina Panthers game to protest a planned liquefied natural gas export facility in Maryland.